Scopitone machine, originally uploaded by blue socks. 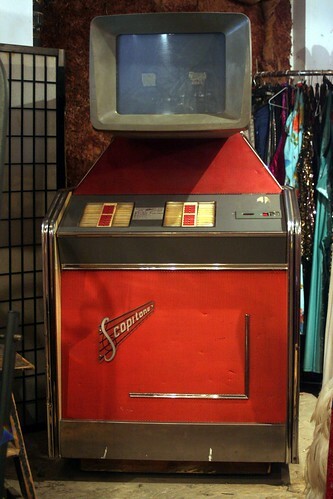 "We were really excited to stumble upon a Scopitone machine in a coffeeshop/thrift store in Montreal! Scopitones were like film jukeboxes. They were invented in France in the early 60s and inspired the music videos of our more modern times. Brian has long been a fan of Scopitone "music films", after learning about this site where you can watch some of them!" Scopitones in Archie Comics, 1965 At I'm Learning To Share! The In Crowd shares some vintage Scopitone Archie weirdness. Thanks, The In Crowd! "Betty and Veronica's brief interlude below at Pop's Chok'lit Shoppe occured in Archie's Joke Book #93 (1965)." Link.